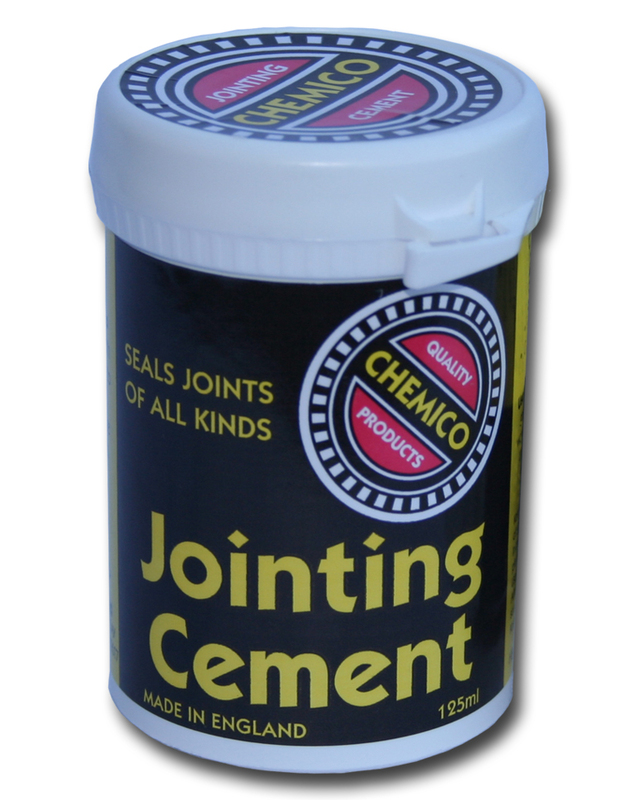 Chemico Jointing Cement is a Liquid Compound that can be applied to any joint either with or without a gasket. It will effectively seal bolted, flanged or screwed joints and as a liquid it is economical to use and will not squeeze into the interior of a joint and cause damage. It is non-abrasive and will not damage highly machined joint faces. The combination of thermal, plastic and adhesive factors in this jointing compound is unique in sealant formulation. The plasticity combats the effects of temperature and pressure changes, shifting levels and stresses associated with assembly of dissimilar metals such as aluminium housings bolted to cast blocks. Apply a coat of Chemico Jointing Cement to each joint face and allow it to remain a few moments until the jointing becomes tacky. Close the joint. For screwed joint, apply one coat to each mating thread and screw up immediately. All joints must be clean and dry and free from any cleaning agents. Multiple applications, for example to a warped cylinder head, can often avoid the need for re-machining. For joints containing washers/gaskets of cork or absorbent material, apply one coat to each side of the washer or gasket and allow this to soak in. Apply a second coat to the joint faces, allow it to become tacky and then close the joint. Always consult manufacturer’s handbook/manual before commencing any operation and follow instructions given fully. The above is supplied for information and is based on laboratory and practical experience. In view of the wide range of applications and conditions of use no liability is accepted for any loss or accident which occur from its use or application.